2013 Theopolis Vineyards, Petite Sirah, Estate Grown, Yorkville Highlands. Theodora Lee’s Theopolis Vineyards is one of the top sites for Petite Sirah in California, her vines hug steep terraces in the Yorkville Highlands and have received amazing critical acclaim since being established in 2003, with her success first coming from the wines made by Mike Officer at Carlisle, and more recently with Paul Gordon’s Halcon version, which I just reviewed. Lee’s beginning her own wine journey now and I was thrilled to taste some of her latest offerings from Theopolis, and her 2003 Petite is an impressive expression of varietal and place with deep intensity and full throttled flavors, it’s more of a studied classic version of California Petite Sirah than the more Rhone(ish) or Cornas like Halcon Vineyards from the same vineyard, this mostly due to the partial whole cluster in the Halcon, and some of it is from the aging in different oak, both are brilliant, but nicely different too, the Theopolis is richer in palate and shows a sweeter opulence. 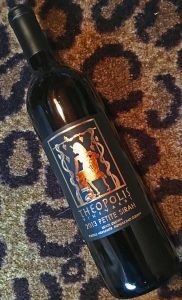 The Theopolis Vineyards Estate Petite Sirah is wonderfully opaque with a dark black/purple hue in the glass, full of dense fruit and power, it weighs in at 14.8%, but still feels remarkably balanced with it’s high elevation and cool climate acidity, it was aged 23 months in 100% French oak, with 25% new, which adds to the class and refinement in this serious wine that has that “wow” factor and impact. Theodora also has a Petite Sirah rose, a couple of sourced Pinot Noir(s) and an estate grown white made from the hybrid “Symphony” grape, a unique crossing of Muscat and Grenache Gris, all of which I will review soon as well, but her Petite Sirah is her flagship wine and the one you should search out, I recommend getting on her list to get these limited offerings. The 2013 Petite starts with decedent and thick black and blue fruits with layers of blackberry, blueberry, fig paste, sweet tree picked plum and cherry liqueur as well as dark chocolate, mixed spices,minty herb, cedar and crushed acacia/violets. Only 285 cases were made of this fruit loaded wine, it really demands your attention with every sip and should age another decade easy with it’s firm structure and healthy ripe tannins, best to enjoy this Petite Sirah with hard sleep’s cheese and or robust cuisine, including lamb or hearty mushroom dishes. Mendocino County is on fire right now, not just with their gorgeous Pinots, but with Syrah, Carignane and Petite Sirah with Mendocino Ridge and the Yorkville Highlands getting their moment in the sun, look for this Theopolis label as well as producers like Signal Ridge Vineyard, The Princess and the Peasant, Halcon Vineyards, Pax (Carignane), Baxter, Skylark Wine Company and especially Drew Family Cellars! These are some of the most exciting wines I’ve tasted from California in recent years with 2014 and 2015 being must haves from this region, bravo to Theodora on a great wine and a truly terroir driven vineyard.